When, in my dialogues with Christians, they run out of ways to defend the Bible, their tactics will often switch to prayer. “I know God is real,” they will say, “because he answers prayer. I’ve seen it.” In fact, so many believers purport to have “seen it” that a dubious spectator like myself must wonder just what exactly have they seen? Once I felt I had a sufficient assortment of responses, I took the posts down and began to weed through the them. I have not altered them, edited them, or augmented them in any way. What follows is an accurate report of my findings. And rest assured that I do not intend to purposely include responses that are favorable to my atheist stance, nor exclude the ones that do not serve my agenda. What is my agenda? To merely discover what exactly prayer avails the believers who use it in America. If someone says they know God is real because they’ve “seen” him answer prayer, then my aim is to see what they have seen. That’s all. One of the very first responses I received was from a man who identified himself simply as the Firefighter. This, presumably, is his occupation. He told the story of having been in a car accident on a major highway. Having lost control of the car in heavy rainfall, the Firefighter began praying intensely as his vehicle swerved across the highway, crashed through the sidewall, and went over a small cliff. The car was apparently mangled beyond recognition upon landing, and all reports suggested that no human being should have survived the crash. But the Firefighter did survive. In fact, all he had to show for the ordeal was a minor bruise on his back. And so he wrote to me to tell of how God answered his prayer right there on the spot. What was his prayer? Why, to survive, of course! Which he did. And this, we must presume, can only be attributed to God. Or can it? Contrast his story with that of a woman who called herself Rosa54. A car accident figures into her story as well, only she wasn’t in it; her daughter was. Rosa54 told me of the day 16-year-old Sophia received her driver’s license. A lifelong Catholic and a fervent believer in daily prayer, Rosa54 said that all she ever wanted in life was to glorify God and raise faithful children. But the very day that her daughter acquired the legal right to drive, she was killed by a drunk driver. Sophia, understandably excited about this major milestone in her young life, wanted to take the family car over to her friend’s house that evening. Rosa54 consented, knowing that she’d have to get used to letting go now that her daughter was growing up. But as Rosa54 watched Sophia pull out of the driveway and head down the street, she sent a plea up to God: “Keep her safe, dear Lord. Watch over her.” We must presume he either didn’t hear her, or chose not to listen. Or, as so many Christians are itching to say upon reading this, perhaps God had some sort of “reason” for wanting to take Sophia from this Earth. In any case, Rosa54’s prayer, unlike the Firefighter’s, was not answered. On her way home later that night, Sophia was hit by a man in a truck who had just left a bar. She died two blocks from her home. In a story similar to that of the Firefighter’s, LUCKY2B, a soldier, told me of the day in Afghanistan when God “covered him with a shield love.” Those are the words LUCKY2B actually used. A “shield of love.” The story goes that, as his unit was moving into some insurgent town near Kabul famous for its ferocity, our man suddenly felt a foreboding deep in his gut that this particular day was his last. He said he just knew some stray bullet was going to find him. And so, adhering to what he had been taught as a young boy in church, he began to “pray scripture” back at God. The passage in question was Psalm 91:5, which reads as follows: “You will not fear the terror of night, nor the arrow that flies by day.” LUCKY2B said that he interpreted “the arrow that flies by day” as enemies bullets. Thus, his prayer that day, which was basically just Psalm 91:5 repeated over and over, was for his own protection. And God presumably honored this prayer, because LUCKY2B was one of the few soldiers in his unit to come out unscathed from what ended up being a brutal bloodbath of violence. He says that God covered him that day with a “shield of love” and allowed not a single bullet to find him. Now, that’s all well and good except for a few unsettling particulars. First of all, when I wrote back to LUCKY2B to inquire whether he intended his prayer to keep all his comrades safe, he wrote back to say, no, he was praying for himself only. This means that the alleged “shield of love,” which, if real, could have covered all of them, was sent by God to cover a man who cared only for his own safety. I wasn’t aware of God typically rewarding selfishness. But most important is this: we simply must assume that most if not all of the soldiers in the town that day were uttering similar prayers. Was LUCKY2B the only person remembering to call on God during this moment of fear and trauma? Surely not. How many of those young men and women that day were hoping and begging for a similar “shield of love” to cover them? Why did God answer the prayer of one man and ignore the prayers of so many others? Was this man’s prayer better? Did it somehow get God’s attention in a way that theirs didn’t? If LUCKY2B can look us in the eye and say that he knows God is real because he’s “seen” him answer prayer, what can we say for all the other poor souls who were killed in that town? Why do some lucky prayerful people get the “shield of love” while others get the shaft? Or is this all starting to look more and more arbitrary to you? Another story involves a woman who wrote to tell me how she asked God for a sign and apparently received one. Beth.X had struggled with depression for years. A Christian who operated mostly on the fringes of the religion due to her social anxiety, Beth.X said her days and nights were spent in deep emotional darkness and despair for many years. Then, one evening, at the moment she finally hit rock bottom, she took a bottle of sleeping pills and a glass of wine out onto her porch. The plan, she says, was to down the entire bottle of pills with the wine, enjoy the sunset one last time, and then crawl into bed and die. Before doing all this, however, she decided to utter one last prayer, one last attempt to reach the God who she thought was supposed to save her. And so, in tears, she asked God for a sign. “Show me,” she said, closing her eyes, “that you’re real and that you care, and I won’t do this.” What do you think happened? Lo and behold, she opened her eyes and noticed a deer had emerged from the woods behind her house and was standing on her lawn. The deer looked at her for a brief moment and then darted back into the woods. This, Beth.X says, was the sign for which she had been hoping. In that moment, she said she suddenly knew that God was real and that he was with her. So, she didn’t take the sleeping pills. Instead, she began a completely new chapter of her life, one that has been characterized by joy. While I’m sure we are all very happy to know that Beth.X turned her life around and is doing well, we must ask whether or not this “deer sighting” was the answer to prayer—a sign, as she put it. Exactly what about the sudden presence of wildlife can be interpreted as a direct link to the existence of the Christian God? Are we to assume that any deer sighting anywhere in the world is proof that Jesus exists, is good, and answers prayer? Are we also to assume that, had Beth.X not uttered that last prayer, the deer would not have appeared? Exactly what should be treated as a sign and what should not be? Who gets to decide that? Where does the line fall? For instance, another woman (who asked me not to include her alias) wrote to tell me that she had recently embraced atheism herself. Aside from what she called “the obvious intellectual reasons for rejecting Christianity,” she said that all her life she looked for a sign in the world that God was real. In her experience, no such “sign” was ever seen. She never saw a deer frolicking in her backyard. She never experienced a moment of transcendence where she knew in her heart that God was with her. No, all she ever saw was the back of father’s hand as it struck her. And then her husband’s. She described her life as nothing but one major heartbreak after another. One of her kids died of cancer. Another was killed in Iraq. Not long after finally finding the courage to leave her husband, the manager at her new job raped her in his office, infecting her with HIV. She said her eyes were always open, looking for some kind of sign that God was good in spite of all she had experienced. But she never saw anything that moved her. How do we reconcile her story to that of Beth.X? Is it just all a matter of perception? Is it a “sign” only if you yourself, in your own heart and mind, are willing to interpret it as such? But if that is true, then all of us can interpret anything we want as signs anytime we want to, and we would therefore have no way of knowing whether or not a good God was involved. After all, humans are very good at seeing what they want to see, and they are also very good at ignoring what they want to ignore. Perhaps the best approach would be to refrain from interpreting any kind of random occurrence, such as the appearance of a deer in the backyard, as a “sign” from your particular God. Natalie2h6 wrote to tell me about the day she misplaced an important envelope. Her father had that very morning loaned her a substantial amount of money to buy a car. Thus, an envelope containing $5,000 should have been present in her purse when she stopped at the bank to make the deposit. But when she began to root around in the purse, the envelope was not there. Understandably alarmed, Natalie2h6 began retracing her steps, growing more and more desperate with each minute that passed without finding it. What was she going to tell her dad? How could she face him after casually misplacing 5k in cash? Shaking now, and on the verge of tears, Natalie2h6 sat on the steps of her front porch and prayed: “Dear Lord, please, please, please help me find this money. I trust you to answer this prayer.” After that, she sat on the porch for a long time, thinking. Then, without any apparent reason to do so, she suddenly had the urge to go into her backyard. There, near the edge of her family’s property, lying in the grass, was the envelope. It had small teeth marks on it, and at once Natalie2h6 deduced what had happened. Her father had given her the envelope as the two had stood in the kitchen earlier that morning. As she went to put it in purse, neither she nor her dad noticed that it had actually fallen to the floor. The envelope never actually made it into her purse. Then, as evidenced by the teeth marks, the family beagle had obviously picked it up in his mouth and, assuming to have found some grand prize, took it out through the pet door and brought it to the backyard to chew on it for a while. Natalie2h6 picked up the envelope and found that all the cash was present and unharmed. It was a miracle, she said, because a public sidewalk ran along the length of her backyard, and anyone could have stumbled upon that envelope and pocketed it. Was it a miracle, though? Actually, no. The laws of physics had not been manipulated. The natural world had not been violated. In fact, nothing even remotely supernatural had taken place at all. All that really happened here was that chance had kept any passersby from noticing the envelope, and intuition prompted Natalie2h6 to check the backyard. After all, it’s not difficult to assume that she had previously observed the family dog abscond with items in the past. But the faithful will look upon this story and say, “Aha! See? God is real! He does answer prayer! She found that envelope before anyone else did. That had to have been the hand of God!” Perhaps it was. But it is doubtful. Intuition leads people to correct conclusions all the time, with or without prayer. Are we to assume that anytime an atheist recovers a lost item, this too was the work of God? Or is it more reasonable to conclude that sometimes lost items are simply found? Moreover, how do you reconcile Natalie2h6’s story to that of Rosa54’s? In one scenario, a woman recovers a lost envelope containing a fair amount of cash. In the other, a woman’s daughter is killed on the very day she acquires her driver’s license. Both women employed the use of prayer. Both women prayed to the same deity. Both women had a history of serving this deity with devotion and humility. But one prayer is answered; the other is not. The answer to the first one happens to have a perfectly reasonable alternate explanation (they always do). But the other prayer, which was considerably more important (after all, a young girl’s life is worth much more than $5,000) and which would have actually required some kind of divine intervention, goes unanswered. And, friends, let us be honest here. Isn’t that always the kind of prayer that goes unanswered? The ones that require something supernatural are never answered. And in these instances, the Christians involved must employ the same indoctrinated proverbs in order to understand it: “This apparently wasn’t God’s will,” or “His ways are mysterious,” or “Perhaps he is just testing me.” But the prayers that are considerably smaller, the ones that always have natural explanations, the ones that don’t require anything supernatural, the ones that usually involve missing items, financial troubles, arbitrary and multi-interpretable “signs,” and the petty, mundane affairs of everyday life—these seem to get answers. There are so many more stories I could share. I could therefore keep going, but I think the point has been made. The fact is that not one of the stories sent to me involved a scenario where something supernatural took place. Not one of them involved a scenario that couldn’t be attributed to humans just seeing what they want to see. There were no instances in these responses where one could say, “Only a God could have done that!” Is the dubious spectator, such as myself, wrong to point out that this is a bit too convenient? Granted, 300 responses, only half of which dealt with reported answered prayers, do not accurately represent the believing community at large. Thus, my study, while interesting and thought-provoking, is not actually conclusive. There could very well supernatural prayers receiving answers somewhere in this world, but until this writer has access to the stories, I myself cannot say that I have “seen” enough to warrant belief in the Christian God. And please understand that it was not my desire or intent to disparage the stories of Natalie2h6 or Beth.X. I have simply wanted to get at the truth. 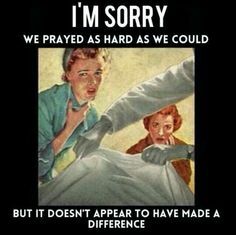 And the only truth I can see here is that prayer, when it really counts, doesn’t work and never has. Quod erat demonstrandum, I’m afraid. ExChristian.Net: "Answer" Prayer: Arbitrary? or Divine?